Our history is replete with examples where both Guard and Active forces were employed to respond to our Nation’s disasters. In the recent era, the defining disaster was Hurricane Katrina, a Category 3 hurricane that forced the breach of levies and the subsequent massive flooding of New Orleans. It rapidly overwhelmed the capabilities of Louisiana that saw the C, NGB send upwards of 50,000 Guardsmen from other States and the President send in the 82nd Airborne Division. There have been other similar incidents in our lifetime: Hurricane Andrew (1992) where President Bush sent 2,000 to 5,000 Troops from Ft Bragg, Hurricane Hugo (1989) where over 3,000 Service members were sent in support, and the 1988 Yellowstone Fires where approximately 1,000 active duty Soldiers and Marines provided direct fire line support as part of JTF Yellowstone. These show that there are those potential catastrophic disasters (New Madrid Seismic Zone, Cascadia Subduction Zone, Cyber Attack, or even an Improvised Nuclear Detonation) that can hit the United States where the President will not hesitate to call upon Federal Forces. 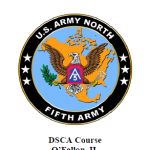 A Defense Support of Civil Authorities (DSCA) Course brochure from July 2012 on legal considerations in DSCA operations. THIS IS ADVANCE WARNING OF AN ANTICIPATED DECISION BY USNORTHCOM PENDING SECDEF APPROVAL TO INCREASE FPCON IN PREPARATION FOR ACTIVITIES COMMEMORATING THE TENTH ANNIVERSARY OF THE 9/11 TERRORIST ATTACKS. 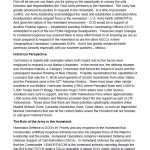 WE ANTICIPATE THAT CDRUSNORTHCOM WILL DIRECT CHANGES TO THE FORCE PROTECTION CONDITION (FPCON) LEVELS ACROSS THE USNORTHCOM AREA OF RESPONSIBILITY (AOR). ALL DOD ELEMENTS TACON FOR FP TO USNORTHCOM WILL PLAN FOR EXECUTION OF FPCON LEVEL BRAVO AND IMPLEMENT SUPPLEMENTAL FP ACTIONS, AS DIRECTED HEREIN, NOT LATER THAN 070600Z SEPTEMBER 2011.